Is it possible to garden year round in practically any climate, without using costly fuel for heat and light during the cold season? This seems almost impossible in most areas of the United States. Yet Mike Oehler, the author of the well-known "The $50 & Up Underground House Book," claims that he has figured out a way to do just this. 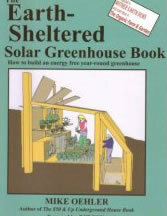 In M ike's latest book, "The Earth-Sheltered Solar Greenhouse: How to Build an Energy Free Year-round Greenhouse," he explains various experiments that he has made over many decades with digging into the ground to take advantage of the inherent heat retained by the earth. Mike has an inimitable, curmudgeonly and witty style of writing that makes this an enjoyable read. Gardeners have often made simple "cold frames" to extend the gardening season by surrounding plants with low glazing. This works for awhile, but eventually the cold will get through and the plants will freeze. Mike tried digging a grow hole with glazing over it, and this worked to some extent, but ultimately cold and insufficient light got to his plants. With Mike's experience living in an underground house he had learned a few things about the way heat and cold behave. He knew that hot air rises and cold air sinks down to the lowest spot available. With this in mind he realized that what the grow hole really needed was a place for that cold air to go so that it didn't freeze the plants. His next experiment was to make a little recessed greenhouse that had a space wide enough to walk in on the south side that was lower than the growing bed. This not only provided a place to stand while working in the greenhouse, but also provided that place for the cold air to reside. This simple idea is really the basis of Mike's remarkable success in greenhouse gardening. He lives in Idaho, near the Canadian border, where winter gardening is a real challenge, and he claims that with this concept he can keep plants alive year round and extend the growing season many months each year...all without additional energy inputs other than the natural heat from the sun and the earth. The book goes into much more detail about various ways to accomplish the requirements of his underground greenhouse concept. He discusses ways to provide a framework that can withstand the pressures of the earth on it. Different glazing materials are evaluated. Strategies for retaining more heat in the surrounding ground and for providing sufficient light and ventilation to keep the plants happy are explored. A surprising area of inquiry is that of companion housing for small critters, such as rabbits, ducks, and chickens, within the greenhouse space. There can be a symbiotic relationship there, where the greenhouse provides a benign habitat, and the animals provide needed fertilizer and carbon dioxide for the plants. They can even eat garden refuse and some insects. Of course all of this has to be carefully managed so that both plants and animals are kept in their places. Mike prefers making a space for rabbits under a walkway in the cold sink, claiming that this is a perfectly natural place for rabbits to thrive; they just need a way to get into the sunlight periodically. With the companion sheltering for animals and plants, there is the possibility of a system whereby a complete diet of veggies and protein from eggs and meat is possible. This is a survivalist's dream! And all can be arranged within a modest budget and without using fossil fuel inputs. Mike's book is liberally illustrated with many delightful drawings of plants, insects, and animals, as well as diagrams and photos of his greenhouse concepts. I think anyone with a modicum of carpentry skill could take what is explained in the book and create a solar heated underground greenhouse that would enhance most any homestead.